Islam is an Arabic word which means: Obedience and Peace. Islam thus means complete submission to the will of God and to be at peace with all the creatures of God. In other words, the fundamental purpose of Islam is to bring back mankind to its Creator and to improve the quality of human relationships. Islam is the only religion whose very name tells its believers what to do and how to do it. Islam provides a complete code of life. Its teachings explain in detail how to co-ordinate beneficently all the human faculties and the bounties provided by Allah, our Creator. The main source of Islamic teachings are the Holy Qur’an – Word of Allah and the Ahadith – Traditions of the Holy Prophet Muhammad, may peace and blessings of Allah be upon him. 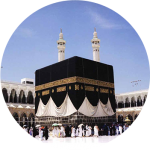 That there were 360 idols being worshiped in the Ka’aba at the time of the advent of Islam! Nearly one for every day of the year.